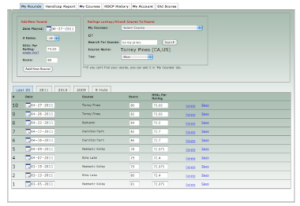 Today we are going to have a closer look at a website that offers a handicap tracking service. There are numerous sites out there that offer this (oobgolf is probably one of my favorite), so, GolfHandicapCalculator has their work cutout for them. As you can see from the screen above, the entry/score review process is pretty straight forward. The process of entering your scores and getting into the application is pretty dead simple. 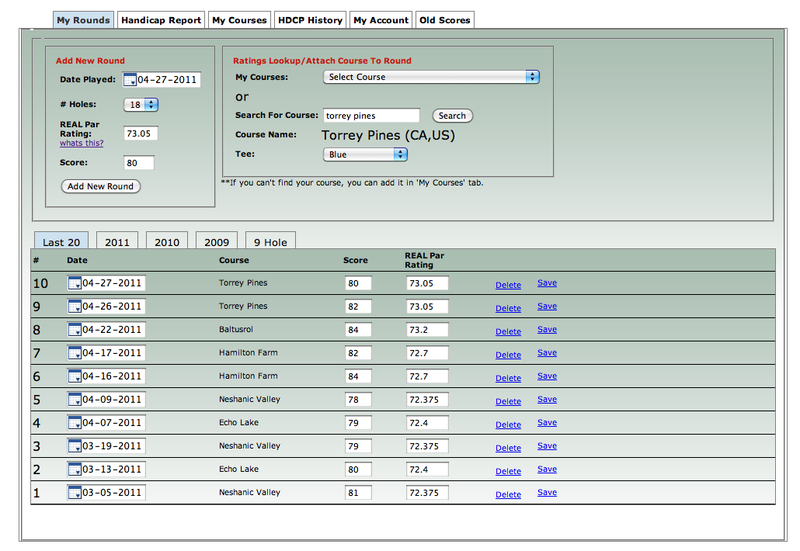 Just log in, select your course, a tee and put in our score. That’s about it. Once you have entered 20 scores, you can also print out a handicap card for yourself. While, this may not get you entered in a USGA event, it’s probably sufficient for your local four-ball. Unfortunately, this is not included in the ‘free’ account. You’ll need to upgrade to the pro account, good news is, this can be had for around $10 a year. Given that most courses will charge you at least $30 a year for handicap service, this is a decent option for the average golfer. 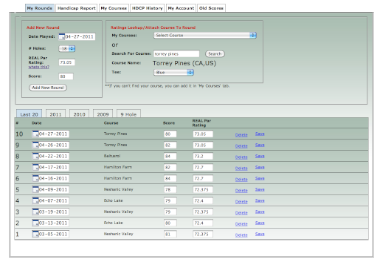 While the simplicity of this site is welcomed, and will probably be a positive for a lot of users, I have really grown attached to my iPhone golf scoring applications that tie in directly to online handicap tracking services. GolfHandicapCalculator seems to be missing that piece. If they could find a way to add that (perhaps open up an API so iPhone developers could publish to their tool) and if they could clean up the interface a little, it could be a compelling service to a wider range of users. If you’re looking for a simple, straight forward, free way to track your scores and handicap, check it out (it won’t cost you anything!). If you’re looking for in depth statistics, community features and mobile phone integration, you may want to look elsewhere. This review was sponsored via ReviewMe.com. While the post was sponsored, as always our goal is to review products without bias. We hope you’ve enjoyed this review! Holy Cow, Having a Child is Time Consuming!